What’s better than pork? I mean honestly, the meat is fairly lean with a layer of fat (and skin if you’re lucky) around the outside that crisps up perfectly when seared over high heat. The whole animal is great for smoking/slow roasting. And pork rinds/cracklins are basically meat crack. So what’s better than pork? Double pork! Enter the easiest and most flavorful pork-on-pork sliders you’ve ever made: herb-rubbed pork tenderloin, with sweet candied bacon and Asian-style slaw. Bam! Preheat the oven to 325. 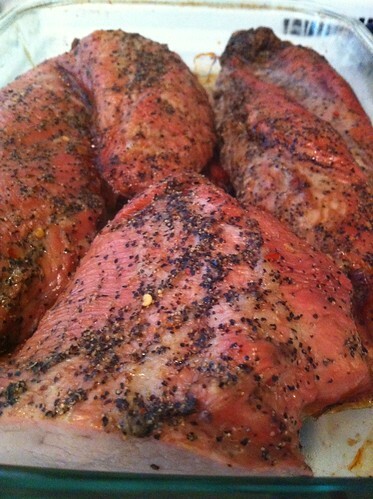 Rub the pork herb rub on the pork tenderloins the night before, place in refrigerator, remove 2 hours prior to cooking to bring to room temperature. Place in baking dish and cover with foil. Cook for about 45 minutes, remove foil, finish cooking uncovered for 15 minutes. 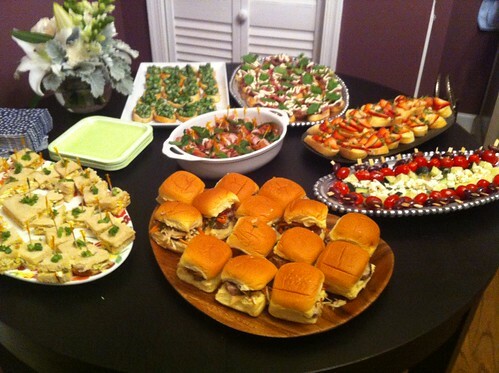 Remove from pan (saving several table spoons of the liquid left) and let rest for at least 15 minutes before slicing. 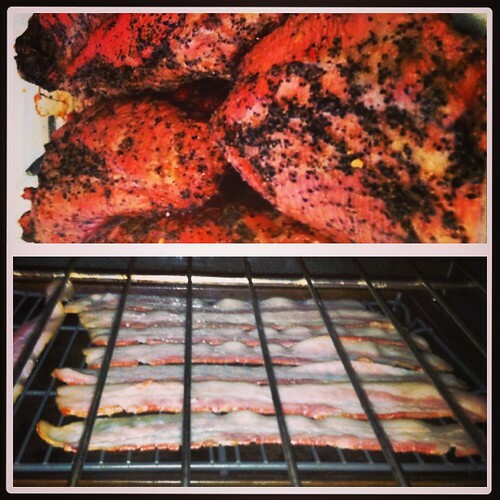 While resting, place bacon strips on a cooling rack, or over roasting rack, and place in the 325 oven. This allows the bacon to cook evenly without losing its straight shape. Remove from the oven and allow to cool. While cooling, mix the leftover liquid from the pork tenderloin in a warm sauce pot with brown sugar and butter, stirring regularly. 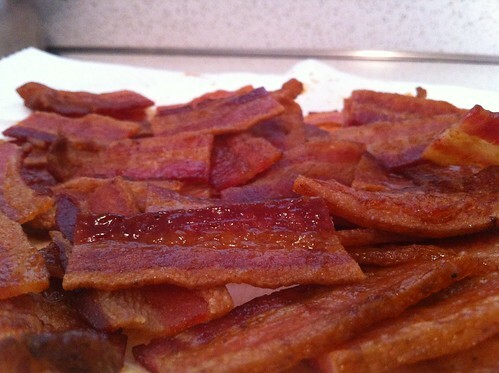 Use a brush or spoon to coat both sides of the bacon with the glaze, preferably while still warm. Cut the bacon into 3 inch long strips. To make the slaw, use a mandolin or sharp knife to julienne the cabbage, carrots and red onion. Slice the green onion/chives very thin and mix together. In a separate bowl, mix the ingredients for the slaw dressing: teaspoon of garlic powder and onion powder, teaspoon of brown sugar, fresh graded ginger root, about 1/4 a cup, 2 dashes of fish sauce, 1/2 teaspoon of sesame oil and rice wine vinegar, 2 small oranges, freshly squeezed. Combine with shredded slaw thoroughly. 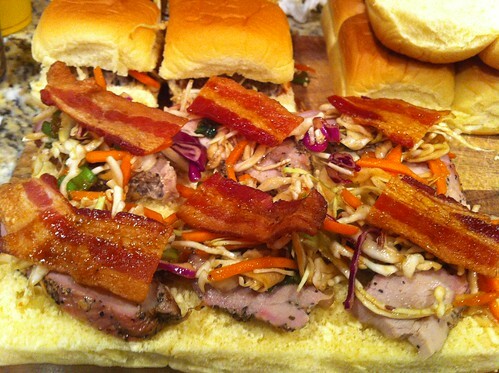 To build – bread, sliced pork, slaw, bacon strip, bread. Easy as that!